I’d like to begin this first of December post by wishing a very Happy Birthday to Nicky the Cook. Be sure to do so as well. Before I delve into this tale, or yarn as it were, I need to tell you a little story about my childhood. When I was a little boy, my grandmother, Nanny, used to crochet things all the time. Sometimes, if she didn’t like how they were turning out, she’d unravel them. This pile of unraveled yarn got scooped up into a bag and tucked away. I spent a lot of time at my Nanny’s side as a kid, so my youthful energy and short attention span would grate at her patience from time to time. It was at these moments that she would produce the aforementioned bag of tangled yarn. She would sit me down, dump out this hot mess of string and tell me to untangle it and roll it into a ball. I’m sure she just meant to keep me busy, but to her surprise I was really good at it. I could hyperfocus and untangle the mess quickly and roll it into a ball for her to make something out of. It became the thing we did together. We’d sit and watch Wheel of Fortune and I’d untangle string and randomly shout “Pepsi Cola” as my guess for what the answer to the puzzle was. She would crochet and enjoy the peace and quiet of the house. I’ve enjoyed untangling things for as long as I can remember. On Thanksgiving, La Duchess mentioned that she had discovered some yarn that she bought in France 20 or 30 years ago while cleaning out an old dresser. She knows that Janie J. knits, so she said that she could have it. Zaxxon brought it by my house yesterday morning. The problem was, the dresser that they were cleaning out has lots of mice living in it. 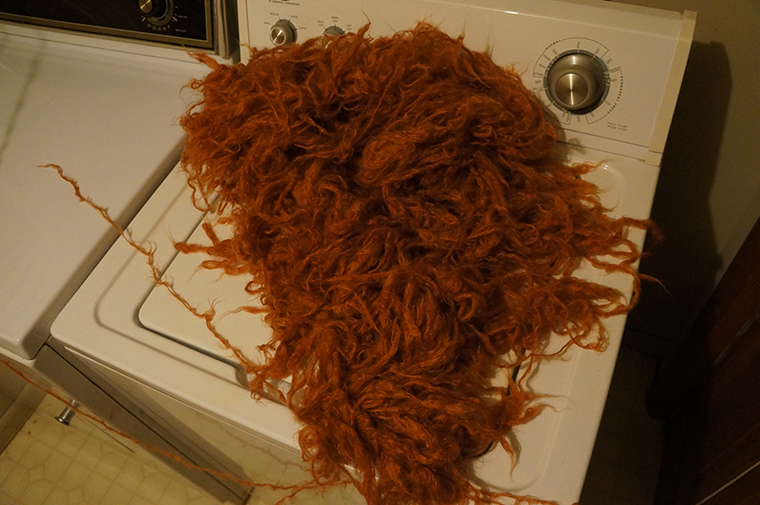 The yarn was still in tact and useable, but was gross with years of mice waste. What was I do to? I couldn’t give it to Janie J. like that. I decided to wash it. In hindsight, the washing machine was not the place to do that. I know that now. But at the time, it seemed like a good idea. I washed all 5-10 skeins of yarn on the gentle setting. This is where I become a crazy person in your eyes. A normal person would look at this, throw their hands up, and claim that this yarn is now garbage. You’ll notice the single string running off of the bottom left hand side of the pile? It took me 45 minutes to find that. Currently, it is about 12 feet long. That’s right. I’ve started to untangle it. It will be my greatest work. My magnum opus. My masterpiece. Because I am a special kind of crazy. But it’ll have to wait. I have nerd club this morning. I will be keeping you up to date on my progress. As the story unravels, as it were. « Aw, You Think That You’re Wonderful. Whoa. Don’t forget to keep us, “in the loop”! This is fantastic! Don’t give up! I got faith in you!